The 2018 Giverny Award winner is this 32-page children's citizen science picture book: Bat Count: A Citizen Science Story by author Anna Forrester and illustrator Susan Detwiler. The book is published by Arbordale Publishing of Mount Pleasant, SC. It was published in 2017. Our 2018 Giverny Award-winning book introduces us to Jojo, her younger twin brothers, and her parents, who set out on an August summer evening to count the bats that fly out of the family barn. The reader learns that when Jojo was younger, there were many bats that roosted in the barn, but numbers dwindled over the years because of white-nose syndrome. Earlier in June, the family counted only one bat. Jojo gathers twigs to build a fire and settles down on the grass with her family to count the bats at dusk. Soon Jojo and her parents see one bat flying out their barn. Though her baby brothers fall asleep, Jojo and her parents keep a vigilant watch for more bats—to no avail. When her mother declares it is time to go inside, JoJo asks her mother to watch a little longer. The family then is excited to see three bats emerge from the barn! Jojo says their one bat must have given birth to twins! Through an engaging storyline, Bat Count reveals how Jojo and her family participate in a citizen science project that monitors bat populations. Susan Detwiler’s illustrations capture the preparation for the bat count, the family’s earlier encounters with bats roosting in their barn, and family dynamics of Jojo, her twin brothers, and their parents. Forrester conveys the benefits of the roosting bats and concern of Jojo’s mother for the dwindling bat numbers. Science concepts contained in the story include the bat’s life cycle, hibernation, disease, interconnectivity of ecosystems, and how ordinary people can contribute to science data collection. 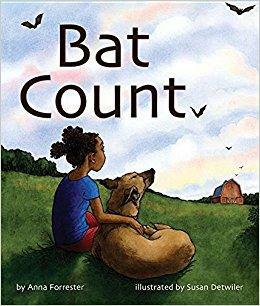 Bat Count is author and former teacher Anna Forrester’s debut picture book. Forrester claims her family of miners and geologists is responsible for the connection she feels with the natural world. Artist Susan Detwiler’s illustrations grace several children’s books. The Giverny committee thinks that through this book, young readers (ages 4-10) will see themselves and their families as potential contributors to science. The encouraging conclusion offers hope that bat populations can rebound from the devastating white-nose syndrome disease. We challenge you to use Bat Count to involve your students and families in citizen science opportunities for bats—and beyond!